When photographer and writer Shreve Stockton decided to move back to her beloved New York from San Francisco, she decided to take her time and make the trip on her Vespa. When she reached Wyoming, Shreve was captivated by the red dirt, the Bighorn Mountains, and the wide-open spaces. Unable to shake the spell of the "cowboy state," she soon found herself trading her New York City apartment for a house in Ten Sleep, Wyoming -- population 300. Shreve threw away her cell phone and took to the rules of the land, adjusting to a lifestyle that was a near antithesis to that of the urban jungle. Time is of a different essence, nature is both livelihood and enemy, deer and coyote mark the dawn and dusk. After she met a local cowboy by chance on the side of the road, first a friendship and then a romance blossomed between them. When Shreve was unexpectedly presented with a ten-day-old coyote pup whose parents had been shot for killing sheep, she had a choice to make. Despite her reservations and the terror of her tomcat Eli, Shreve decided to do the unthinkable -- to raise the coyote pup she came to call Charlie in her 12 12-foot log cabin. In arresting prose and illuminated with Shreve's breathtaking photography, The Daily Coyote is at once Shreve's month-by-month exploration of Charlie's first year and a meditation on the nature of wildness versus domestication, of nature versus nurture, and of forgiveness, loyalty, and love in all its forms. Shreve has definitely given me a new perspective on coyotes. I loved this book for many reasons. The writing is the best that I've read in a long time. The words flew to my mind and painted the pictures with ease. The story is fascinating, and the adventures refreshing. The author compares and contrasts cultural detail in a very interesting and useful way. I could not put the book down. The year with Charlie the coyote is a poigniant, humorous, complex, and succinct book. I wouldn't say it moved me to tears, but I must have gotten a fleck of dust in my eye. More than anything else, this is a story of a random act of kindness, the rescue of an orphaned coyote, and the love that a person has for this canine and the ways the canine reciprocates. In the end, the author had to rethink her understanding of roles and responsibilities as Charlie required her to act like a pack leader rather than a friend, and eventually to accept harder decisions. The pictures are alternately beautiful and funny, and have an animal that is more wild than not in poses that any dog owner will recognized (making them funnier). A beautiful and moving book! I have a dream of walking across the country with my best friend but the thought really scares me. Shreve's courage is very inspiring and her story gives me confidence in fulfilling my big dream... thank you very much for revealing your soul to the world. It was with no little skepticism I started The Daily Coyote. I live away from town, in a subdivision surrounded by fields and mountains and the sight of a coyote is a daily thing. When I moved in I was warned by neighbors not to let any pets roam, less they become a tasty snack. Coyote ears bring a small bounty in my neck of the woods. The idea of a coyote living with a human was patently foolhardy. Shreve Stockton fell in love with Wyoming on her way to New York. Soon the lure of the big city was forgotten and she returned to Ten Sleep, Wyoming. Soon her time was consumed by finding a place to live (not a very luxurious abode) and work. Befriended by Mike, a government trapper who's job included killing coyotes, she is surprised when he brings her a tiny coyote cub, orphaned by one of his kills. After she decides to keep the pup she names him Charlie. Soon Shreve's days are filled with Charlie's antics and trying to acclimate to the demands of living with a wild animal. She often depends on the kindness and understanding of strangers to help her and Charlie. Her friendship with Mike (a compelling character in his own right) develops into a romance and he is cautious about the burgeoning bond between Shreve and Charlie. This is a charming book, filled with Shreve's photographs of a developing Charlie against the Wyoming backdrop. The books title comes from Shreve's posting of the photographs for her family and friends to enjoy. Soon they were being passed along to others and eventually a blog was set up so others could enjoy the antics of Charlie. At the heart of this book is the fact that Charlie is a coyote and essentially a wild animal and there are limits with training and bonding between humans and animals. There is no sugar coating; Shreve is unsparingly honest and straightforward. As Charlie matures,i found myself torn between letting Charlie's wild side take over and sadness if Charlie were to disappear. This makes the unlikely friendship between coyote and the writer all the more satisfying. A treasure of a book. Shreve Stockton's, The Daily Coyote, was an interesting audio book ( I also had the printed version from the library for the amazing photographs). Shreve Stockton tells the story of she ended up falling in love with a small town of 300 in Wyoming, when she really intended to drive a scooter all the way from San Francisco to New York City. In Wyoming, Shreve became romantically involved with a cowboy/government trapper whose job was to protect livestock by killing off the coyote population. When he finds an orphaned coyote pup in a den he just smoked out, he gives it to Shreve, and she decides to try and domesticate it. She names the coyote Charlie, and she soon realizes she has traded in her independence when she takes on this task of raising the young pup, and introducing Charlie, the coyote to her cat Eli. The photos in this book are amazing, especially the ones of Charlie. It seemed a little surprising to me that a city girl like Shreve, could end up living in a rural cabin with no running water, no heat and no inside plumbing. I am one of those people that love all things wild, so of course the story of a woman all but living off the land in Wyoming wilderness appeals to me. That is the guide for this book's following--you need to be an animal and/or nature lover and someone who will not be terribly offended at the idea of a person taming a wild creature. I'm okay with the concept. Even so, the tale of Shreve Stockton's struggle to deal with this loveable coyote is the meat of the book. Stockton writes honestly, simply, with some observation of the beauty around her and plenty of focus on this coyote. Yes, a coyote named Charlie is the focus of the book. This came as a huge relief to me; I was almost afraid this would become some romanticized tale of love and magic in the fairy tale land of Wyoming. Nope. Stockton is the author of a blog from which this book is based. While she adds the notes of a relationship between her and a hunting guide named Mike, she never step out of the boundaries of the novel, and I think that is what keeps this book going. It's good, entertaining, introspective, but could have been more. Shreve Stockton blindly and boldly moves her life to a small town in Wyoming and this is her story of personal survival. Along the way, she meets a man named Mike(who happens to kill coyotes for the government) that presents her with a tiny baby coyote pup that she raises as a pet. The book chronicles her life during the fist few years of her life with Charlie, (the coyote) as well as her relationship with Mike- though the story predominantly focuses on Charlie. To earn a living, Shreve sets up a subscription service on the internet for people to receive a photo a day of Charlie which eventually leads to a blog. (and later yet, a book deal.) She reveals that the blog garners her a great deal of both positive and negative attention about her raising a wild coyote pup. I sympathized with her over this, though I guess it was somewhat to be expected. I applauded her when she said that once she grew weary over the verbally violent flame wars that would develop on the site, that she removed the comment section altogether. Shreve has a distinct gift for writing, as well as for photography, and her pictures of Charlie and the beautiful Wyoming wilderness are liberally scattered throughout the book. My only complaint is that I wish she had not revealed that she only had 6 months to complete the book. The book does in some places read like a personal diary, and it can be repetitive, especially with regards to her clothing. I appreciated the little details about her life, but I was more interested in what kinds of meals she prepared with a grocery store hours away rather than what dirty clothes she put on that day. I think that with more time, this book could have been a knock it out of the park classic if she would have been able to further flesh out her own struggles with daily life, rather than focusing mostly about Charlie. There are some truly golden nuggets of wisdom in this book, and while it is a story about a woman and her coyote, I wanted more about how she adapted to a rural lifestyle after having moved from the city. With regards to her decisions on how she raised Charlie, I have no judgments and I respected her decisions. When she had difficulties, I appreciated how she would diligently seek answers, including reaching for Caesar Milan's book when Charlie started showing aggression. Why did she marry the coyote? First of all, I found the writing excellent and the photography truly stunning. What bothered me was the plot of the story: Girl meets nice boy (Mike) who cares about her, lets her be herself, doesn't try to control her. Girl meets bad boy (coyote), ditches nice boy for him. Shreve is always trying to change herself to make life easier for the coyote. She turns her own life upside down to accomodate him. He has a violent streak, but when he bites her (read: beats her up) she always forgives him and feels that it's because of something she is doing wrong. She has to be the one to change. She has to become more sensitive to his needs. Haven't we all seen this story before? If Charlie was a guy, no one would be writing all these glowing reviews. They would be saying she needed to go to a battered women's shelter before it was too late. I'm hoping that Shreve will write a sequel in which she comes to the realization that she is in a classic abusive relationship. She has given up her life, her friends and a wonderful boyfriend for a handsome cad with dangerous tendencies. I'm not criticizing the coyote - he's just being a coyote. I'm criticizing Shreve for falling into the trap so many women fall into. Where is Dr. Laura when we need her? I would like to know a lot more about Shreve's life - her parents, her childhood, her young adulthood. She drops a few hints which make me believe that there is a fascinating story to be told. In fact, I would rather hear about her thoughts and her experiences than about the coyote. Please keep on writing Shreve, but don't let the coyote run (or ruin) your life! Couldn't put it down until I finished it! I expected a heart-warming animal story, but what I got was a personal shift in perspective regarding freedom, courage, and commitment. My copy of the book is full of markers, like touchstones, to return to and explore. I picked up another copy of the book today to share with friends. It will be interesting to see if any of them will see the bigger story that struck so many chords with me. And, if not, then the lighter story about Charlie, Eli, and Blue Eyes will be fun also to share. It's a great story, from a great story-teller. Thank you Shreve for your blog that has lifted my spirits on many a grey PNW day, and for this book that feels like a key to deeper self-knowledge and empowerment. It's unusual for a book with a rich narrative to have such beautiful photography. The Daily Coyote is unique for that reason alone. The story itself is compelling: A woman takes in an orphaned coyote and raises him. For any animal lover, the day-to-day experience is interesting enough. But to also have such evocative photographs! It makes for a book tough to put down. I first heard of The Daily Coyote blog when Charlie (an orphaned coyote pup raised by a woman in Wyoming) was featured on Cute Overload. I've never been much of a coyote fan (really, who is? ), but this little guy was just irresistibly cute. Now Charlie's adoptive "mom," Shreve Stockton, has chronicled their story in "The Daily Coyote." The book follows her abrupt move to the wilds of Wyoming, her blossoming romance with a local coyote hunter (of all things), and how Charlie entered her world -- along with the challenges of sharing one's life with a wild animal. Shreve's photos are beautiful, and she's a very good writer, too. (Perhaps a bit too flowery for me at times, but then I'm a journalist, so my taste runs toward the pithy.) Being a die-hard cuteologist, I would have liked to have seen more photos of Charlie as a baby, but the ones of him as a lanky adolescent and a surprisingly noble-looking adult are fabulous, too. 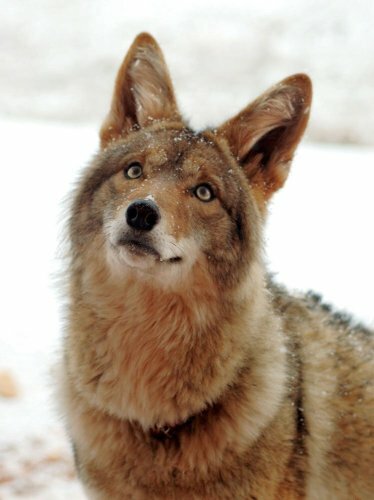 There's been a lot of controversy online about the wisdom of keeping a coyote as a pet. While it's easy to say, "Well, -I- would never do that," the fact is that a lot of us wouldn't know what else -to- do with a precious baby coyote whose life was in our hands ... especially when no wildlife rehabilitation facility would take him. I think I probably would have made the same choice Shreve did -- take him in, figure things out as I went along, and hope for the best. She's certainly honest about the challenges that she encountered as Charlie matured and tried to assert his dominance. Shreve Stockton being a free spirit decides to move from NYC to a small Wyoming town of 300. One of her new friends gives her a coyote puppy and the story begins. Shreve's book is the narrative of her adapting to the small town and the adopting of the coyote pup named "Charlie". Ms. Stockton provides a great narrative of her experience interspersed with her fabulous photos. This was an enjoyable read and I found myself comparing my new puppy experience with her Charlie experience. Hopefully there will be a follow up book on Charlie. Like other reviewers I have also been following The Daily Coyote blog for some time, but not from the US, from Greece. Every morning I check in to see what Charlie, Eli, Chloe and MC have been up to and to admire the photographs. I received the book (pre-ordered from Amazon) just before Christmas and I sat down and read it from cover to cover. The writing is evocative, the photographs stunning and I didn't want it to end. Although it gives wonderful descriptions of the landscape and life in a rural cabin, the true heart of the book is Shreve herself and the way she describes her relationships, first of all with Charlie, but also with Eli and Mike. I felt true admiration for the way she faced difficulties and overcame them with much heart searching. Finally, like other reviewers, I hope there is a sequel in the pipeline and I highly recommend this book to everyone. May "The Daily Coyote" Live Forever ! This is a fascinating book and one that many would enjoy even if they are not "Coyote fans". The writing style is quite good and the author is able to make a humourous story about the simple antics of animals. A wonderful book. So nice to read an animal book where the main character is still alive at the end of the book! The planets aligned perfectly to bring Shreve, Charlie, Eli and Mike together under the stars. The experiences they have had, and will continue to enjoy, are truly miracles of a deep nature.... I fell in love with all these souls in this book and couldn't put it down for a moment....I will hold this book forever in my heart..
For those of you who love and understand the pain, turmoil and ecstasy of nature and animals, you will also cherish this book. The photos of Charlie and Eli are so sweet and delicate in their essence. I wish I could have reached in and hugged them both and brought them both out with me so I could take them home.. I am truly a cat lover and a dog lover and I live where coyotes come to my window at night and peek in....They pass by my house pretty much every day or I see them in the fields as I drive by. I have always remarked at how perfectly stunning they are with their fluffy coats and their beautiful eyes. They are exquisite in their danger. I want to know what happens next! What's the next chapter? How is Charlie doing? How is her new puppy Chloe? How is that brave and bold cat Eli? And are Shreve and her man still together? Also, the pictures in her book are awsome! She is an excellent photographer as well as an author. She has a real eye for taking a picture that really feels like you are there or that you want to be there! The pics of Charlie are adorable! I like her writing style. It's easy to read and she is so open and honest, you feel like you know her by the time you are done reading the book, she has become your friend. Shreve's story is compelling because it's unusual, but Shreve is also a highly gifted writer and photographer. I am grateful she possesses these skills because many people have stories to tell, but few are storytellers. Like the Wyoming landscape, Shreve's prose is strong, direct, irrefutable, and evocative. She speaks factually and truthfully and yet always from the heart. Readers won't find shallow sentiment or a Disney movie here. There is pain, heartache, and great beauty. This story has me kicking off my shoes and staying awhile. On a personal level, Shreve's story is helping me examine my tendency to play it safe and avoid risks. The book itself is beautifully bound and the paper is high quality. This one's a keeper for collectors.